I’ve been somewhat obsessed with this whole bang bang sauce so in an effort to have it again for like the 10th time in the last 3 weeks, I decided to give it a try in a pasta form. And boy, am I glad I did because of all the bang bang recipes I’ve tried lately, the pasta one turned out to be the best. It’s also the easiest bang bang recipe ever! 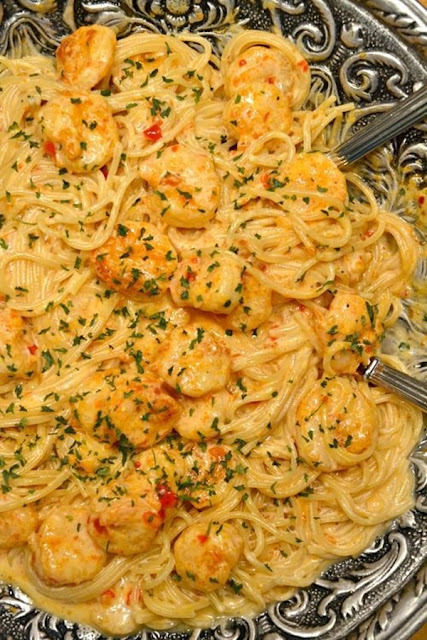 All you have to do is roast some shrimp in a little bit of paprika for that smoky flavor, and while that’s in the oven, you can boil up your pasta, and make that epic, creamy bang bang sauce. Once that’s done, you can toss those together for the creamiest pastas of all time, giving you a kick of heat and refreshing tangy goodness!